-Sturdy and durable steel stand. -Adjustable to fit your height. -Adjustable spotters for your safety. -Rubber end caps that protect your floor from scratching. -This is a better choice for your home exercise safely. Package include: 1 pair × Barbell Stand Warm Note: The barbell is not included. 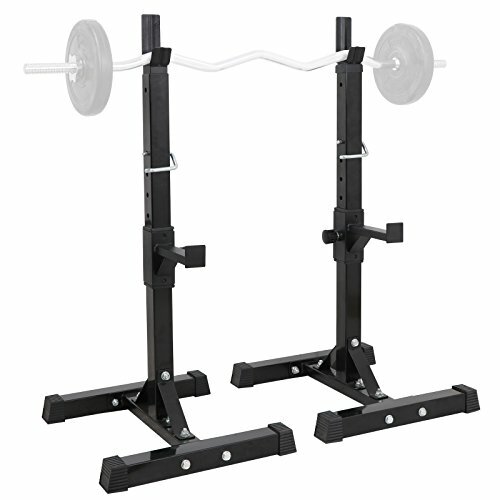 ✦ Sturdy & Durable -- ZENY Barbell Stands are made of heavy-duty steel construction material that provides Maximum safety, Max Load Capacity is 550Lbs. ✦ Height Adjustable -- Adjustable Barbell Rack that suitable for a variety of height requirement. Bracket Height range of 41''-66'', Adjustable to fit your height and adjustable spotters for your safety. ✦ Guaranteed Safety -- Non-slip and abrasion-resistant rubber end caps firmly position the squat rack that protect yourself and your floor from scratching, and legs are welded on straight, stand upright without wobbling. ✦ Easily Assemble -- Designed for easy installation. Full instructions & all mounting hardware are included.